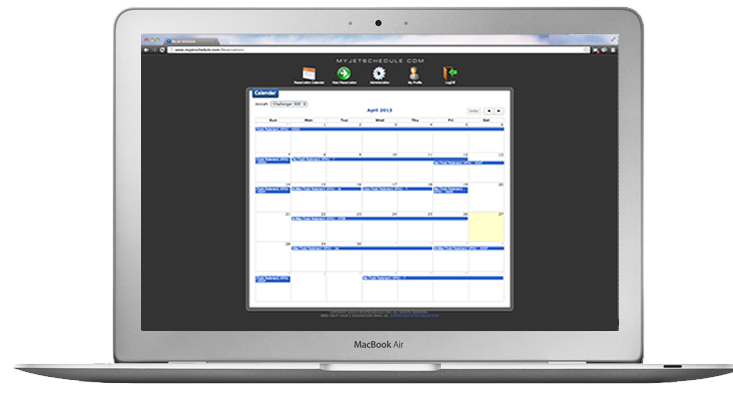 Easy to use software that coordinates schedules between executives, secretaries, and pilots. Why should I use My Jet Schedule for my aircraft? Fully functional shared calendar allows you to see when your aircraft is reserved and when it is available. Makes coordination easy. Store passenger documentation such as passports or internationall entry forms on a passenger by passengere basis. Find the closest airport to a street address, city, or zip code. Search results are filtered by your aircraft settings. Keep pilots informed of schedule changes. Automatic email notification are sent when any reservation is created or updated. Need to know how long a flight is going to take? Each reservation shows you the flight time and arrival time in your destination time zone. History log allows you to audit who created and updated each reservations and when the change was made. My Jet Schedule is a clean, easy to use aircraft scheduling software. It has a simple design that anyone will feel comfortable using. Saves time and money by coordinating schedules between executives, secretaries, and pilots.